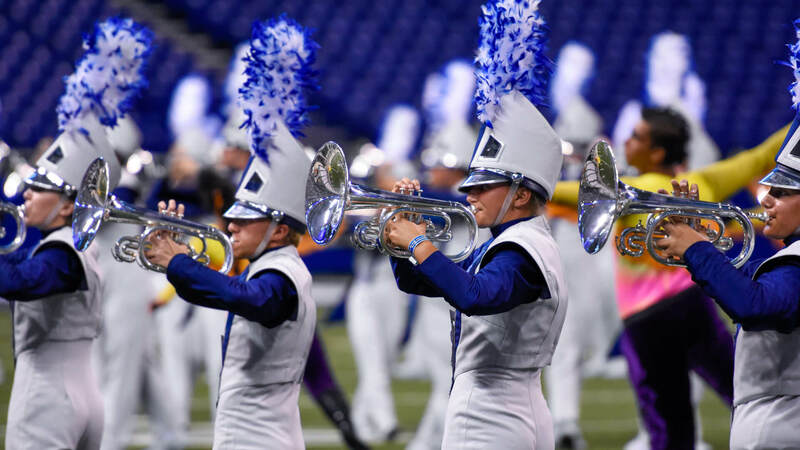 For the second year in a row, the top three finishers at the DCI World Championship Prelims were separated by a point or less, with the Blue Devils topping the field of 40 corps at the first of three days of competition in Indianapolis' Lucas Oil Stadium. The Devils, who earned first place with a score of 97.363, picked up victories in general effect and total visual and kept what could potentially be their seventh undefeated season alive in front of a record Prelims audience — the largest that has gathered at Lucas Oil Stadium since the event moved to Indianapolis in 2009. “There's nothing else to say other than the fact that I felt ecstatic about that performance,” Blue Devils drum major C.C. Waggoner said. “It was a terrific run-through. It's the start of these three nights of shows, and I've gotta say I've never had a Prelims that was that enjoyable." Santa Clara Vanguard (2nd, 97.000) continued to hold its spot just behind the Devils on Thursday, while taking the top spots in the percussion and color guard captions. 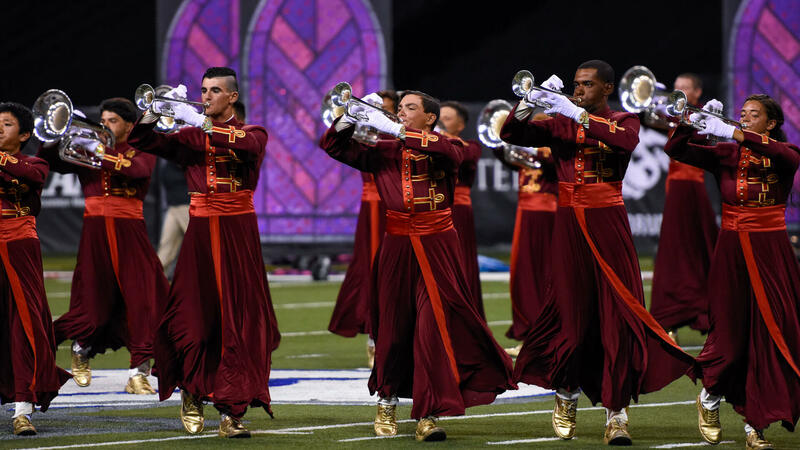 The corps' distance from first place shrank from its most recent gap of 0.625 points on Sunday in Buffalo, New York. 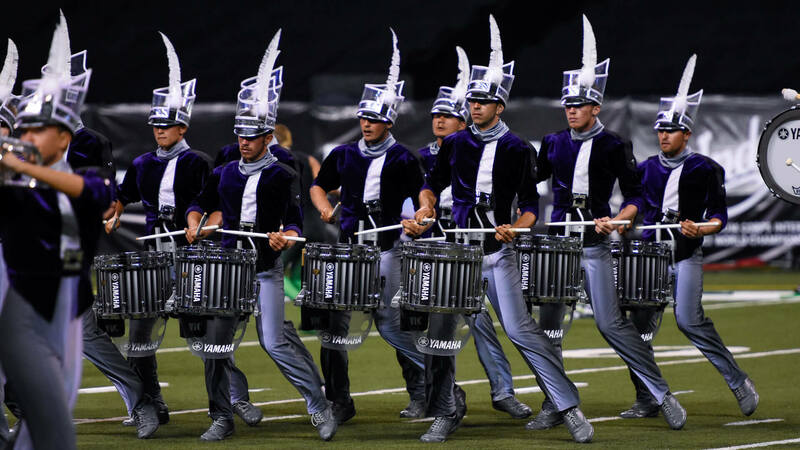 Just around the corner, Thursday's brass caption-winner Carolina Crown (3rd, 96.363) kept its momentum after having recently pulled within just 0.15 of Vanguard, the closest margin between the two this season. In an effort to stoke their general effect score at the season's pinnacle, Crown added a few more visual tweaks to its deconstructive-themed show, including a set of tarps laid in the end zone that creates the effect of the field being torn apart. While staying within striking distance of the top three, the Bluecoats (4th, 94.638) continued to have The Cavaliers (5th, 94.125) nipping at their heels, as the Green Machine kept within half of a point of the defending champs for the third straight head-to-head meeting. Boston Crusaders held serve in sixth place, scoring a 93.200 to stay ahead of The Cadets (7th, 92.263), a tight competitor with the Boston corps since early this season. While the 10-time World Champions from Allentown held an edge in general effect, the Crusaders kept their lead thanks to advantages in total visual and music on the scoresheet. Looking to mount an upset, The Cadets will certainly look to make each of their remaining performances count as the season pushes to the finish line. 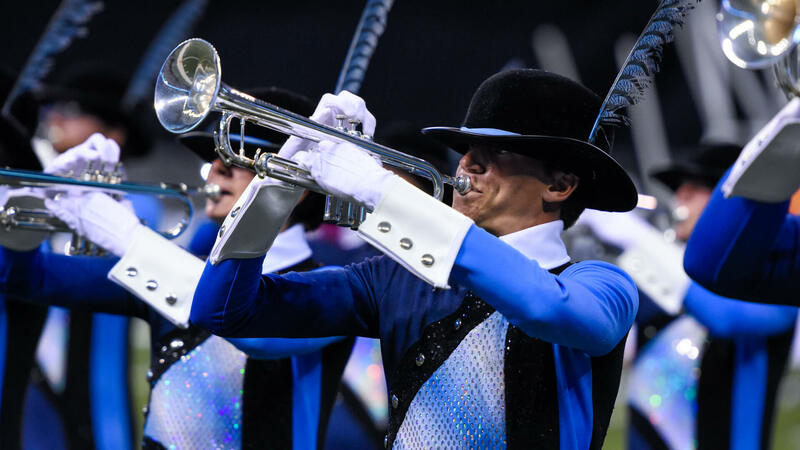 After falling behind at the end of July, Blue Knights (8th, 90.175) defeated Phantom Regiment (9th, 89.150) for the third straight head-to-head meeting, while increasing its lead to its largest since mid-July. Another hotly-contested battle for a spot in the top 10, the Blue Stars (10th, 87.550) edged back ahead of the Crossmen (11th, 87.425) for the first time since July 15. With the two corps never separated by more than a point this season, the tight competition provides extra motivation going into the season's final push. In the race for the last spot in Saturday's Finals competition, the Madison Scouts (12th, 86.150) kept a significant edge over their closest challengers, as Mandarins held 13th with a score of 84.213. 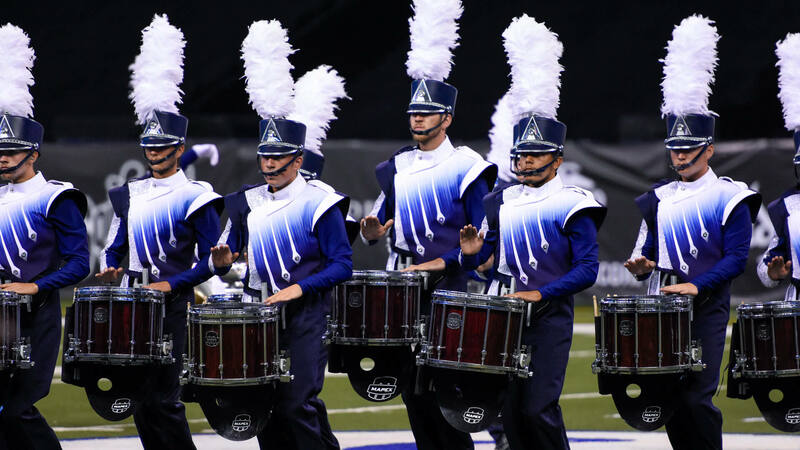 The Colts (14th, 83.450) earned their highest placement of the season, defeating The Academy (15th, 83.075) for the first time since 2015, largely due to a solid edge in the visual caption. This year's Open Class champion continued to put together a historic run, as Vanguard Cadets (16th, 81.500) defeated the Troopers (17th, 81.025) for the first time in their history. A 16th-place finish in Friday's Semifinals would also tie the corps' all-time highest from 2015. Vanguard Cadets, along with Open Class silver-medalists Blue Devils B (18th, 80.175), found themselves scoring among the World Class ranks once again, after both finished in the top 20 the past three seasons. Spirit of Atlanta found itself just behind Blue Devils B in 19th place with a score of 80.050 while fending off Oregon Crusaders (20th, 78.700) and Pacific Crest (21st, 77.788), the two of which have been locked in a tight race for several weeks. Open Class bronze-medalist Legends (22nd, 76.800) clinched a third consecutive Semifinals appearance, while the newest World Class corps, Genesis, also advanced with a 23rd-place score of 76.125. Music City (24th, 74.950) — which earned its highest-ever finish at the Open Class Finals on Tuesday in fourth place — will make its way back into the Semifinals for the first time since 2013 after ending in 27th in each of the past three seasons. In 25th with a score of 74.350, Spartans snuck past Seattle Cascades (26th, 74.125) by mere tenths to earn their sixth-straight spot in the Semifinals. Despite finishing just outside of the Semifinals cut-off for the first time since 2014, members of the Seattle Cascades wrapped up their 2017 season feeling satisfied with their final performance. In 27th with a score of 71.613, members of Jersey Surf wrapped up their 2017 season with heads held high after a long and memorable summer tour that recently included the opportunity to perform for the band Snarky Puppy, whose piece "Shofukan" is utilized in the corps' production, "Make It Our Own." Louisiana Stars (28th, 71.563) — which earned the title of “Most Improved” Open Class corps this season — moved up significantly from last year's 31st-place finish in just its second year coming to Indianapolis. Gold (29th, 70.100) also rose by two placements from last year's Prelims, but was closely followed by a newcomer to Indianapolis, as four-time Drum Corps Europe champions THE COMPANY (30th, 70.038) impressed in its first DCI World Championships appearance. Just over two tenths back from there, 7th Regiment (31st, 69.800) improved its final score from 2016 by just over a point. 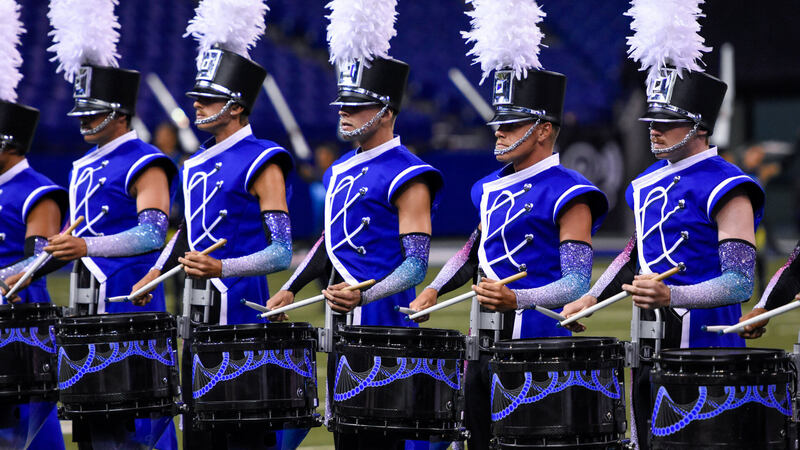 In its first trip to Indianapolis since rejoining the Open Class ranks in 2015, Southwind (32nd, 68.838) expanded its lead over Guardians (33rd, 67.838) from Tuesday's Open Class Finals in Michigan City, with the vast majority of its advantage stemming from the general effect caption. Also capping off its season in Thursday's Prelims, Pioneer took 34th with a score of 65.913. 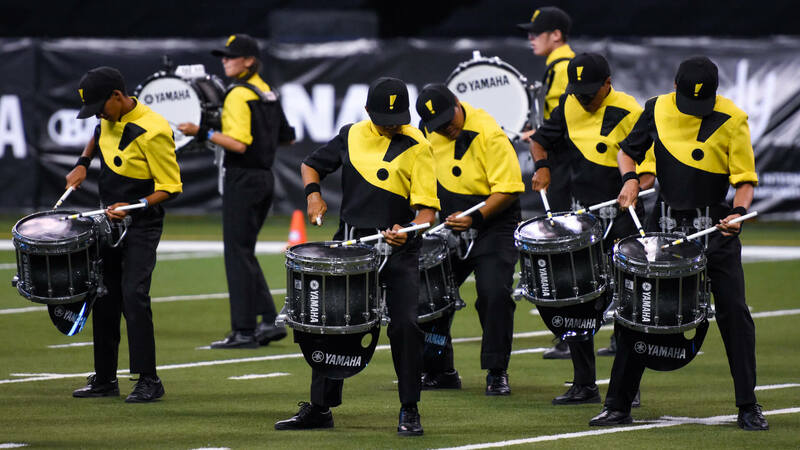 Defeating the likes of Jersey Surf, Gold and THE COMPANY in percussion, River City Rhythm (35th, 65.700) saw its score improve by four points from the 2016 World Championship Prelims, with Raiders picking up 36th with a score of 63.525. Shadow (37th, 62.000) kept a steady lead over the Colt Cadets (38th, 60.925) in the corps' final meeting of the season. 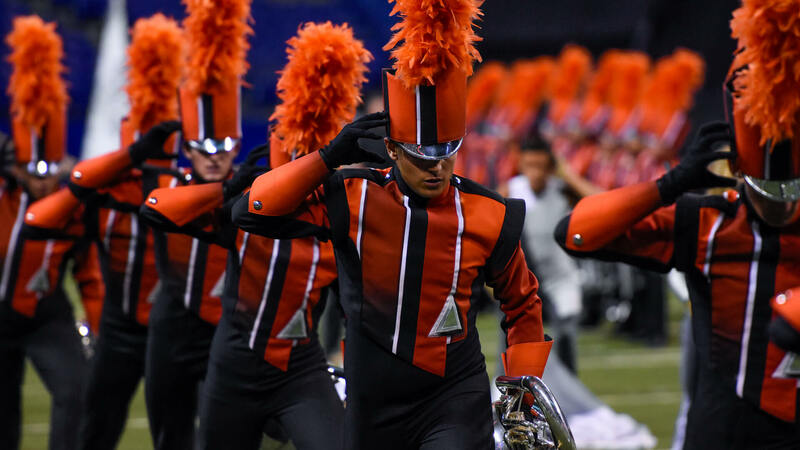 With Thursday's tally, however, members of the Iowa corps improved upon their score from last season's Prelims by nearly five points, while also moving up one position. Closing things out on the score sheets, Impulse (39th, 57.550) and Les Stentors (40th, 54.725) also wrapped up their 2017 seasons. 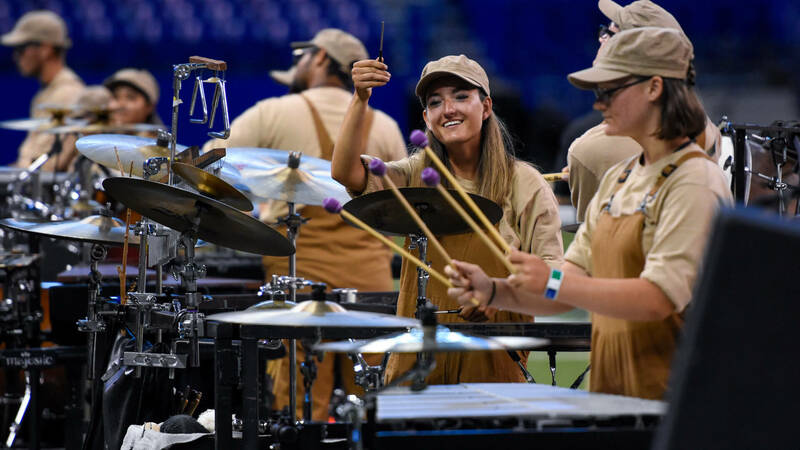 As a rookie age-out having a first and last performance at Lucas Oil Stadium, Thursday's performance for Impulse bass drummer Gino Defusco was extra special. With competition as tight as ever, the top 25 corps from Thursday's 14-hour event will have a quick turnaround, heading into Friday's Semifinals with a coveted spot in the top 12 on the line. Watch all 25 corps compete at the DCI World Championship Semifinals on FloMarching.com.